Advanced Process Control (APC) fine tunes the controls and demand profiles of boilers, chillers, and other process components. APC is powered by the industry-leading AspenTech® DMCplus. 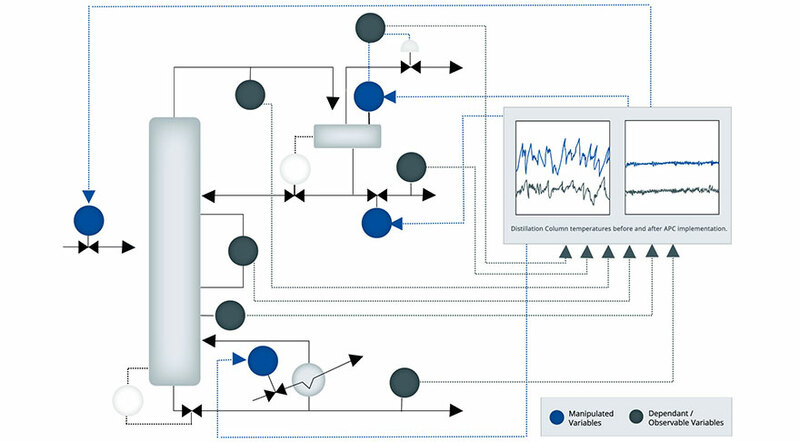 This multivariable model-predictive controller interfaces directly to processes via the DCS or indirectly through process information management systems, and is capable of safely pushing processes to multiple constraints simultaneously. This control system is proven to solve large-scope problems without compromising the control system service factor. Each manipulated variable is moved through a series of setpoints. The e­ffects of those changes on the dependant variables is recorded. A dynamic matrix model is created that can predict plant behavior based on the interactions of all manipulated and dependant variables. Control actions become anticipatory rather than reactive, and plant operations are optimized while maintaining plant safety and compensating for process disturbances. Using a combination of Model Predictive Control and Statistical Process Control, APC reduces variability of key variables by 50% or more, increases yield of more valuable products, and maximizes throughput and profit by moving the process to an optimal set of plant constraints. APC is like having your best, most experienced operator on duty 24 hours a day.